Notwithstanding his questionable business practices- often overlooked by patrons because of his artistic genius- Stuart was the most inventive and influential portrait painter of the Federal era. Much of his success rested on his ability to convey through an unlabored, graceful style the dignity and character of his subjects, whether they were presidents or merchants. Praised in literary circles as "The American Sappho," the Boston poet Sarah Wentworth Apthorp (Mrs. Perez Morton; 1759-1846) sat for Stuart for three portraits, of which this is by far the most dynamic. An unfinished sketch, the picture reflects Stuart's emphasis on features and expression. 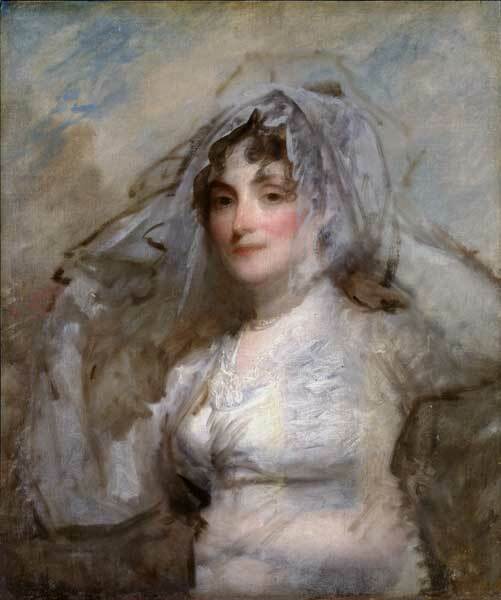 Close examination shows that he first painted Mrs. Morton's arms folded at her waist and then redrew them adjusting her lace mantilla in a seemingly spontaneous gesture. The sympathetic rapport between artist and sitter revealed in this vibrant, intimate likeness is documented in an exchange of poetic verse in which the painter and poet each extol the talents of the other.